Extreme Barbie Jeep Racing has spread all over the world like wildfire. It is the sport of taking old power wheels toys, tearing out the gears and motors so they wheel free wheel and racing them down a hill. The events are single elimination that two racer hit the hill at a time. 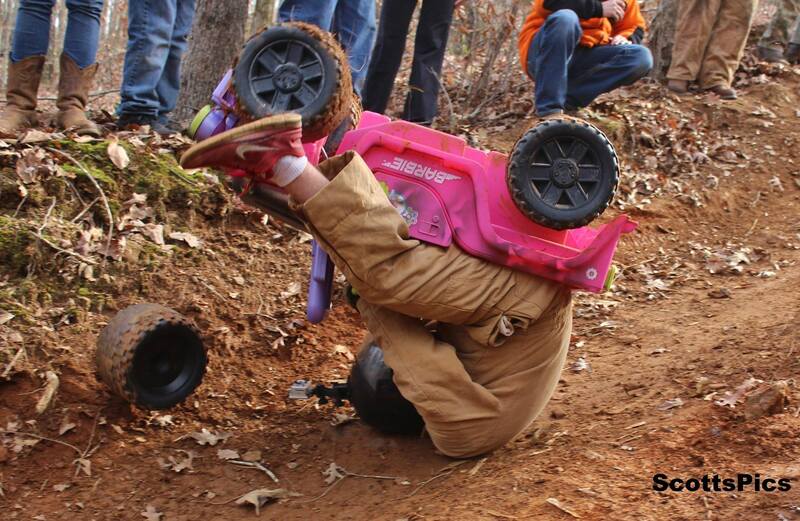 The Final Race of the 2014 Extreme Barbie Jeep Racing Season was held at Morris Mountain ORV in Heflin, Alabama during the Annual RBD event and was nothing short of Epic. Matt Myrick aka Busted Knuckle was in the points lead coming off of back to back wins in the past two races and had a brand New custom painted Barbie Jeep ready to rock for this race. The hill at Morris Mountain is one of the best we have seen featuring a turn towards the top then a long straight hill cut into the mountain side. These plastic toy cars hit ridiculous speeds before they slam into the hay bales at the bottom of the course. Busted Knuckle started off down the hill in round 1 and lost a wheel then a steering wheel as he crashed across the finish line as his competitor broke his ankle in a crash further up the hill. The new rig was junk so he traded it in for Gator offered up by another competitor who was out in rouund 1. After some nasty crashes and pile of destroyed vehicles Matt Myrick aka Busted Knuckle took home the win. His 3rd in a Row, making him not only the 2014 Champ but also the most winning-est Extreme Barbie Jeep Racer of All Time.